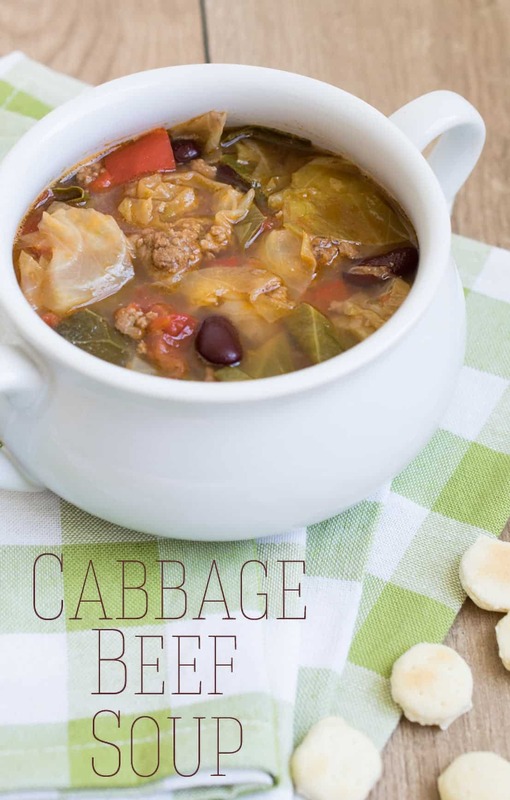 A hearty soup and a great base, this Cabbage Beef Soup recipe is so easy to make! Works well as a slow cooker soup too. Today’s recipe brings back so many childhood memories and a weird food bond I have with my Dad. My father worked in the hard rock genre of music (think Iron Maiden, Deep Purple, Judas Priest). While that may sound really cool to an adult, I was a kid and my perception of that time period was through the eyes of a child. What I remember about the music business was midnight concerts and practice sessions into the wee hours and all my little heart wanted to do was go home to my bed with its adorable cherry printed sheets. It’s a wonder I don’t have hearing problems too. I completely shared his enthusiasm for this soup, though. Good thing it was an all you could eat kind of place. The cabbage beef soup seems like such an odd mixture of ground beef, cabbage, and tomato broth. I can’t decide if it’s a really odd version of chilli or a cabbage roll in soup form but it’s so delicious and hearty.It is kind of unassuming that way. I haven’t been to a Shoney’s in well over a decade, so I have no idea if this is a recreation of the original or not. I based my version on the memory of what it tasted like when I was 10. And, well, it tastes just like I remember, lol. I even top it with the same oyster crackers as I did back then. This soup really brings back family memories and I just want to say thanks, Dad. Thanks for the memories, thanks for making sure I grew up straight, and thanks for making me eat my veggies. A hearty soup and a great base, this Cabbage Beef Soup recipe is so easy to make! Works well in the crockpot too. In a large pot over medium heat, brown the ground beef and drain. Add all the remaining ingredients to the beef. For the tomatoes and beans, add in everything including the juice. Bring to a boil and simmer for about an hour or until the onion and celery are tender. Add more water or beef broth if you desire a thinner soup and bring to temperature. Serve hot with oyster crackers on the side. This looks so good! Beef and cabbage is definitely a perfect combo!